I hope everyone is enjoying a happy holiday season. 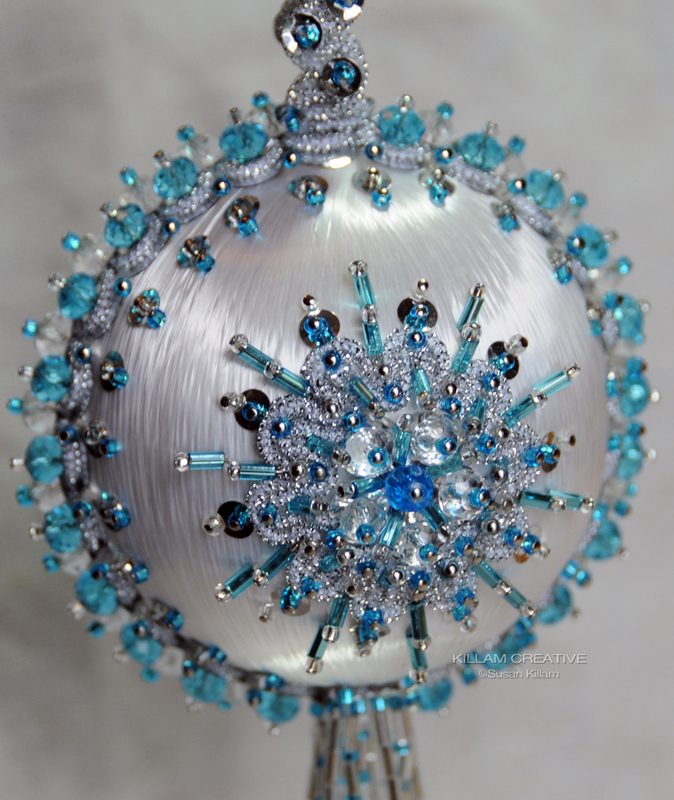 OK - here it is January 11th and I'm finally getting around to sharing finished photos of the beautiful Cracker Box kit ornament. I gave it to my brother and his new wife for Christmas! Hiya folks! Phew, it's been too long since I wrote here *and* sat in my studio. 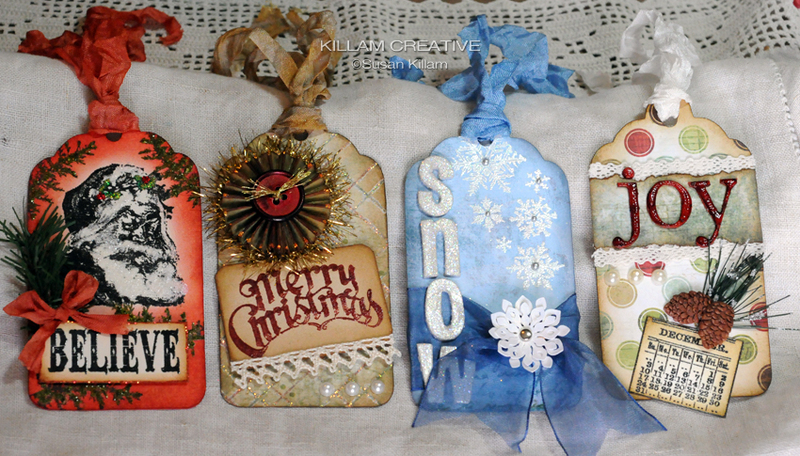 I was all set to play along with Tim Holtz's 12 Tags of Christmas - I even started my version of the first one! Then life got in the way and I haven't been back to assemble Tag 1 or try any of the others. I've been watching as he uploads a new one each day and some techniques I love and will definitely try. I wanted to share bits of my Tag 1. I don't have any of the supplies he used so I improvised, which is really the point of all of this. Use whatcha got on the cool techniques he shows! Edit Jan 12th: And here's the finished tag! My husband and brother-in-law exchanged donations to favorite charities instead of gifts. I made a certificate and wrapped it up with this tag for his Christmas. Here's a link to Tim's Day 1 tag. 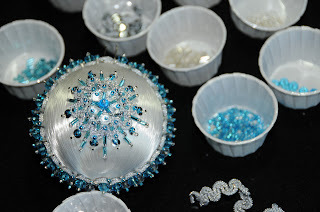 I used a Cuttlebug snowflake embossing folder on Co'ordinations paper. The grungeboard noel letters are were painted silver then covered in German glass glitter. The pinecones are real - just painted and glittered. 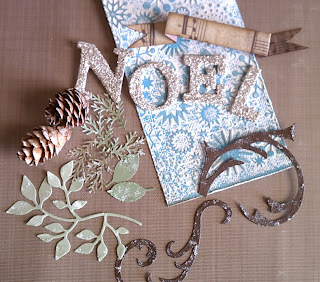 The foliage is a combination of Sizzix Sizzlits, a Bigz die and punches. I used different color greens and touched with white paint and rock candy Stickles. I still need to touch the edges with brown ink and curl them so they're not so flat. 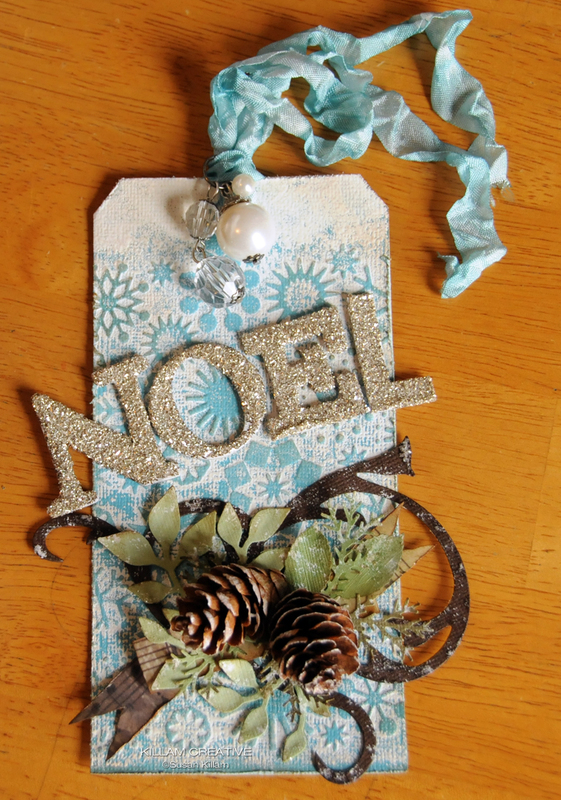 I'm considering more swirls to use with the "noel". 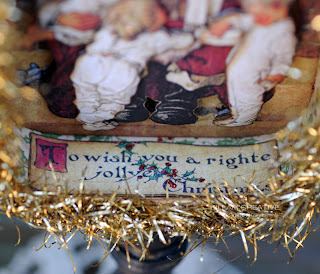 I'd cut from grungepaper and cover in the same glass glitter. And I still have to make the baubles. :) I'll show the finished tag soon! If you want to see some real 12 Tags magic, visit Shelly Hickox. She blows me away with every project! So, anyway, I'm still around! Ha! The family is coming in for an early Christmas this weekend and it's smooth sailing (a/k/a studio time) for me after. [Edit Jan 12th: if only that ended up being true!] I hope your days are festive and fun! The tin is perched atop a wood candlestick from the craft store. I painted it black then swooshed a little gold here and there. The knob at the top got the same treatment. The Santa image is from Graphic 45's Christmas Emporium. 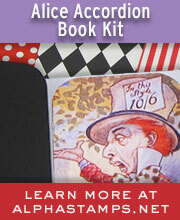 The 8x8 pack is chock-full of gorgeousness! There are three layers including the base one with the fireplace. then Santa with kids and the last layer is just the kids. Two of the stockings are layered, also. This little sign covered a bump created when I had to add a teeny tiny nail to hold the tin to the paper. I thought my mighty glue would work, but it pulled away enough to make me nervous, so the nail went in after the tin was finished. Of course I couldn't find one with a perfectly flat head! The back is also G45, including the "special delivery" tag and little postage stamps. I know my swap partner received the today but I won't get mine until Monday. She's wicked talented so I'll be sure to show you hers too! Hiya folks! 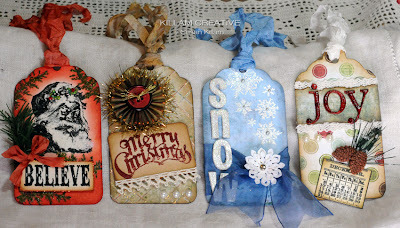 In honor of today's start of Tim Holtz's annual 12 Tags of Christmas frenzy, I want to share a couple of tags I made last weekend. They are small - 4.5" x about 2.5", and three are inspired by tags from his 2010 collection. I made them as free gifts for shopping in my Etsy store on Small Business Saturday. The wonderful customer who received these has been very kind to me throughout the year and I think I gave her more than she bargained for... in a good way! I had a lot of fun with these, using scads of Tim Holtz and Ranger stuff I've either not used before or used in new ways. The only one not inspired by the 12 Tags is the blue "Snow". 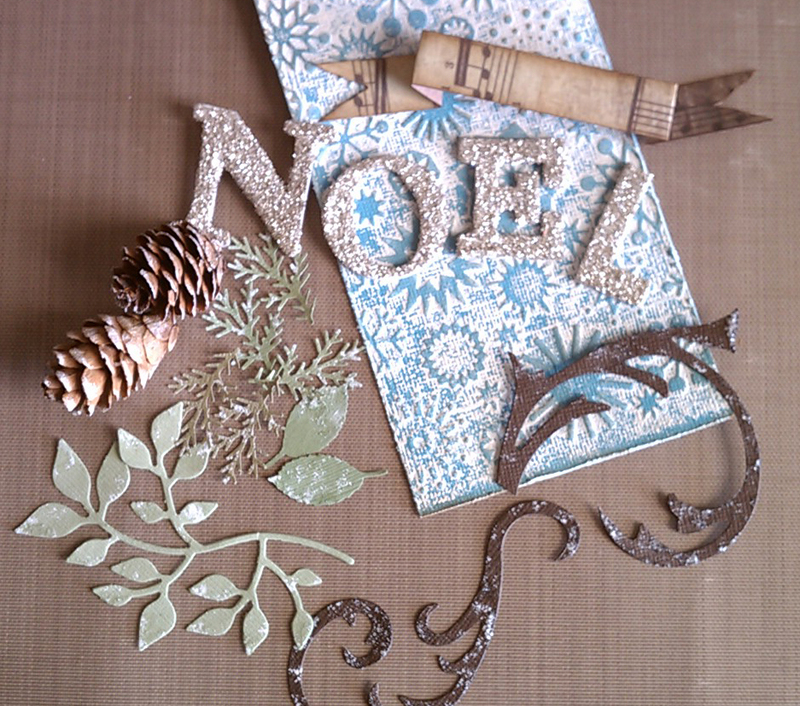 I had the letters from a different project and paired with white embossed TH snowflake stamps. The cut-out flakes are from a Cricut cartridge - maybe from Joys of the Season since that's the only Christmas one I have. Oh, and the rosette is a 1/2" x 12" strip of paper scored at 1/4" intervals. Easy do-it-yourself! If you're not familiar with Tim or his tags, check out his blog - today is day 1 of the 2011 tags, and if it's any indication of what's to come, I might just play along. They are great for learning new techniques and you definitely don't have to use his products. At the bottom of his posts you can see where other people have uploaded their versions of his tag. It's fun to see the inspiration!